Australian soldiers at Gallipoli knew Plateau 400 or "Lone Pine" the scene of a fierce hand-to-hand combat in World War 1. 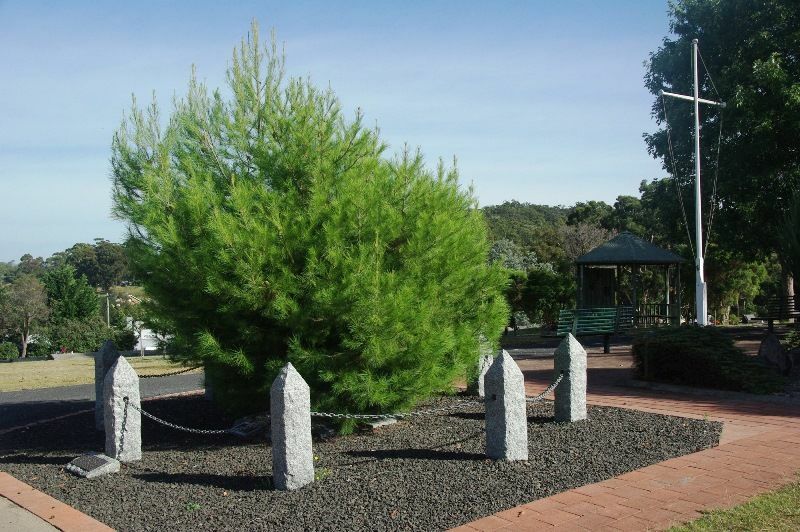 A solitary "Aleppo Pine" bore silent witness to the heroism and tenacity of Australians who fought there. At 5.30pm on 6th August 1915, Australians of the First Brigade attacked Turkish trenches under machine gun and artillery fire. They removed the roofing over the trenches and jumped in below. After savage hand-to-hand fighting the trenches were taken by 6 pm. Attack and counter attack continued until 10th August when fighting ceased and the position was firmly held by the Australians. Of the six Australian battalions involved eighty officers and 2197 men were lost in the battle for Lone Pine. The Turks lost between 5000 and 6000. 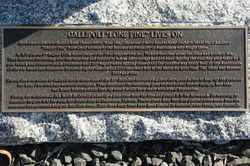 During the evacuation of Gallipoli thirty- three men of the 24th Battalion mounted a gallant rear-guard action to keep up the pretence the Lone Pine trenches were still occupied. They destroyed the remaining guns and embarked before daylight, less than two hours before a storm blew up which would have made withdrawal impossible. During the withdrawal, Sgt. Keith McDowell picked up a pine cone from the tree and placed it in his haversack. On returning to Australia he gave it to his aunt, Mrs Emma Gray of Grassmere, Victoria. Twelve years later Mrs Grey (sic) planted some seeds from the cone and five sprouted and grew into little trees. Since then many trees have been planted in memorial sites throughout Australia.